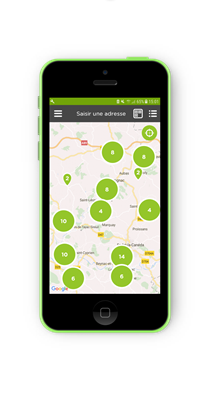 Over 1000 charging stations rolled out in Occitanie territories according to a smart, carefully thought-out and responsible regional roadmap. If you do not wish to subscribe, you may use the RÉVÉO service occasionally. On the RÉVÉO smartphone app, pay your charging session at the regular rate. Geolocate the terminal via the Android/iOS Smartphone app or by clicking here. Using the badge or the Révéo app (for members), by scanning your Révéo badge. Without the Révéo badge (for occasional users) by selecting the charging station and starting the session after entering your payment information. Plug in your cable to the terminal and vehicle. Close the terminal door to lock and secure access to the terminal. Make sure the vehicle has started charging. your badge or the Révéo app (for members) and unplug your cable from the terminal and vehicle. your Révéo app (for occasional users) and unplug your cable from the terminal and vehicle. Make sure that the door to the charging terminal is closed properly in order to close your session. Recharge at home, at work, at the store, at car parks, and more! The average cost for 100 km is €3 for an electric vehicle vs €8 for an internal combustion vehicle (diesel, petrol)!